The scale of the crisis facing children in South Sudan is “staggering” according to the United Nations Children’s Fund (UNICEF), which warned today that the future of an entire generation of the country’s children was being “stolen” by the year-long conflict. Since violence erupted in December 2013, almost 750,000 children have been internally displaced, with 320,000 more living as refugees. UNICEF says that approximately 400,000 children were missing school, 12,000 reported as being used by armed forces and groups, and children were subject to violence, malnutrition and disease. “Monday [15 December] will mark the first anniversary of the return to conflict in South Sudan. 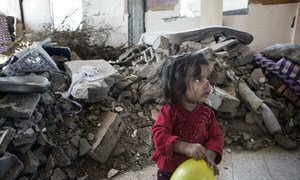 The world’s newest country, which began with so much promise three years ago still faces only a fragile peace,” UNICEF spokesperson Sarah Crowe told reporters today in Geneva, and one year after the conflict began, children are still under daily threat. That created the urgent need to bring peace and stability to the country by early 2015. While South Sudan avoided falling into famine this year, continued conflict is likely to cause a much more devastating food crisis. Despite avoiding famine, malnutrition rates among children in South Sudan have doubled during the conflict. To meet the challenge, UNICEF has scaled up its nutrition programme, bringing additional partners in to help with the expanding caseload. So far, more than 80,000 severely acutely malnourished children have been admitted to therapeutic care. UNICEF and the UN World Food Programme (WFP) Rapid Response Missions have also been reaching remote communities by air, delivering a range of critical services, including screening and treatment of children for malnutrition as well as safe water and sanitation, immunizations and registration of separated children so they can be reunited with their families. To counter the interruption of the education of vast numbers of children, a campaign called “Back to Learning” is working to rehabilitate 225 damaged classrooms and provide the estimated 400,000 children forced out of school with access to education. To fund its emergency response in 2015, UNICEF will need approximately $166 million. Never in recent memory have so many children been subjected to such unspeakable brutality, the United Nations Children’s Fund (UNICEF) said today, as 2014 has been “devastating” for some 15 million children caught up in violent conflicts around the world.